Completed 2010. 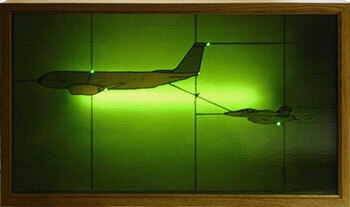 This internally lit glass panel, done largely in shades of green, depicts a nightscope image of a U.S. Air Force KC-135 Stratotanker refueling a Navy F/A-18 Super Hornet fighter in mid-air somewhere over Pakistan. Journal Sentinel article about this piece 9/7/11. News article about this piece 7/1/10.